This week, the Planck Satellite team announced major findings from over a year of observations of the Cosmic Microwave Background (CMB), or the radioactive sludge that lingers in our universe from the beginning of time, right after the Big Bang. And while there's a lot to digest, I wanted to give you some high points for your weekend nerd-outs. Image: ESA and the Planck team. The CMB is a humble reminder of where we come from. Oh sure, the universe now sits at a freezing 3 degrees above absolute zero, but it wasn't always that way. About 380,000 years after the Big Bang, the universe was about 1000 times smaller than it is now, and about 1000 times hotter as well. At that time, the universe finally cooled enough to neutralize all of the atoms, and what radiation remained has been traveling virtually unimpeded ever since. Astronomers spend an inordinate amount of time looking at and for this radiation. And why not? It's the best, most direct probe we have of the beginning of time. But first, a bit of a backgrounder. In May of 2009, the European Space Agency launched the Planck Satellite into orbit. On paper, Planck sounds very similar to the WMAP satellite launched 8 years earlier, or the COBE Satellite launched in 1989: measure and map the perturbations in the CMB. While the remnant light from the Big Bang is almost the same in every direction, it's not exactly the same. There are tiny – almost laughably tiny – variations from point to point in the sky of about 1 part in 100,000 from place to place. But those tiny differences mean a lot. The blue spots in the map above correspond to directions slightly cooler than average, while the red spots are slightly hotter. Those hot and cool patches ultimately give rise to the mass perturbations in the universe that we see today, including all of the large scale structure (galaxies, clusters of galaxies, etc.) that we see around us. You might reasonably wonder why we needed another satellite at all. After all, we already had COBE and WMAP (which ran nearly twice as long as originally expected), plus a bunch of balloon experiments. Credit: ESA, Planck. From Planck Results 16: Cosmological Parameters, Figure 1. If you've never seen one of these plots before, large scale (corresponding to the whole sky) is to the left while small scale (corresponding to something like 4 minutes of arc) is to the right. The red curve is a purely theoretical model, while the blue dots (with error bars) show the average of the data. Upshot: we are seriously on the right track here. Yesterday, the European Space Agency (ESA) made a public announcement about the data and results from 15 months of observations. Essentially, they adjusted the various cosmological parameters until the red curve above matched the blue dots as closely as possible. In addition, they adjusted to include information from the WMAP satellite and other cosmological measurements. Thirty (!) technical papers were officially released on the arxiv earlier today, and there were a few big surprises. Notably, they found a little more dark matter (the hidden matter in clusters and galaxies) and a little less dark energy (the stuff that accelerates the universe) than previously supposed. The "before Planck" side is basically what was found using the WMAP satellite and a bunch of other measurements, while "After Planck" used all of that plusthe new data. But it was more than just finding a slightly different cosmic recipe than we previously thought. We also found that the expansion of the universe is a little more pokey than we'd thought. The number cosmologists use to describe the expansion is known as the "Hubble Constant" and it basically describes how quickly distant galaxies appear to recede from us. Instead of the best-fit 71 km/s/Megaparsec from WMAP, Planck found only 67 km/s/Megaparsec. This is a relatively small difference, though some astronomers think that the discrepancy between the new number and other independent measures of the expansion rate are uncomfortably large. In either case, you can take comfort in the fact that when you plug in all of these numbers, the the age of the universe is still about 13.8 Billion Years. If you read a certain type of science blog, somebody is likely to make a big deal of the fact that the best fit age of the universe got nudged ever so slightly upwards, but rest assured, we're still within the expected range predicted by cosmologists for a while now. Should you freak out about these differences? More dark matter means more awesome, right? While it's always interesting when the best-fit cosmological parameters get tweaked, you need to remember that these are estimates and that there are always errorbars involved. In this case, the differences between these results and the WMAP 9 year results are something on the order of 2-sigma or so, which is just a fancy way of saying that we'd expect these sorts of differences around 5% of the time. Interesting, and likely to bounce around a bit, but nothing earth-shattering. What else, besides the numbers? The funny thing about the universe is that on the largest scales, the whole thing may be curved. But in order to measure the curvature of space, you need to look at very distant objects, including radiation from the Big Bang itself. 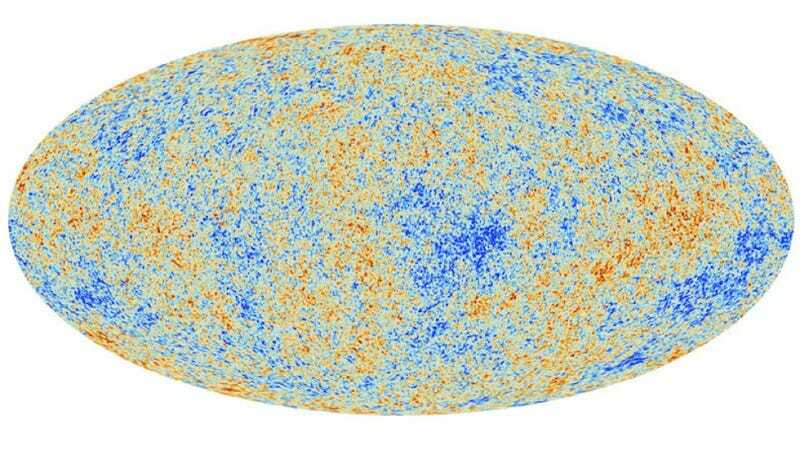 Planck is basically telling us that the universe really truly does seem to be flat. This is great! And unsurprising given the standard model of inflation. we find no evidence at the current level of analysis for... a dynamical form of dark energy, nor for time variations of the fine structure constant. Dark Energy is mysterious, and a big part of the mystery is that we don't really know where it comes from or why it behaves the way it does. But Planck is telling us something important: as near as we can tell, it really is constant – kind of like the "cosmological constant" found in Einstein's equations. Likewise, despite some claims to the contrary, physical parameters seem to be fixed. we do find evidence for deviations from isotropy at low l's.In particular, we find a coherent deficit of power with respect to our best-fit CDM model at l's between 20 and 30. Don't worry about the terminology. These "low l's" really just mean that there is some anomalies on large-ish scale. We'd expect the universe to be extremely smooth on large scale, but apparently, even after you subtract out the expected signal, we're still left with a little extra bump and wiggles (and a cold spot that was also seen by WMAP). The large-scale structure doesn't quite fit. One hemisphere has a little more in the way of perturbations than the other. The Planck team isn't making a huge deal about this, but they do raise the very real point that if there's interesting new physics in the early universe, it's going to come from explaining where these discrepancies come from. The thing you need to realize is that cosmologists rely in large part on the "cosmological principle" which says, in part, that the universe is statistically the same in all directions. Apparently it's not, although the effect is quite small. The question is whether the effects are just unlikely random noise, some new effect we hadn't considered, or some totally new physics. The problem with doing this sort of science is that we only have one universe to experiment with. the first detection at high significance (42 sigma) of the cross-correlation between CMB lensing and the cosmic infrared background, which allows us to constrain the star formation rate at high redshifts. This, and some of their other results, are putting very tight constraints on the epochs of the first stars. This is is pretty cool, because those stars essentially ionize nearby gas, and we measure that ionization. Of course, there's zero chance of us seeing those first stars directly. the first robust (2.5-sigma) detection of the Integrated Sachs-Wolfe effect via its cross-correlation with Planck-detected lensing, providing independent evidence for Omega_Lambda=0.7. This is a very big deal. The Integrated Sachs-Wolfe Effect basically measures the difference between the blue shifting of microwave background photons as they fall into forming clusters and the redshifting as they climb out. They measure, in effect, the overall increase in structure over a finite amount of time. Since the growth of structure is directly predicted by cosmology it is a very robust way of putting an additional constraint on the models. The point is that these really are a beautiful set of observations – one that suggests we really have a good idea of how our universe works, but also one with just enough unanswered questions to keep theorists happy for a long while to come. Dave Goldberg is a Physics Professor at Drexel University, and the author of "A User's Guide to the Universe," and the upcoming "Universe in the Rearview Mirror" (coming July 11!). You should follow him on twitter, or better yet send him your questions about the universe.